When I heard about the 100 day project, I knew I wanted to participate because I do love jumping headfirst into random internet projects. Problem was, this usually focuses on creative artists and I didn't really have any creative skill that I wanted to showcase. That's a question I've spent the last 2 weeks asking myself as I prepare for this project. The answer did not come to me until this morning. The 2 things I love and talk about (on this blog) CLOTHES and MONEY. So how do I spin that into a creative endeavor? Well, welcome to 100 Days in my Clothes. I'll spend the next 100 days (knocks wood) highlighting a different item in my wardrobe and talking about it. Yep, this is the intersection of shopping, photography, clothes and money. 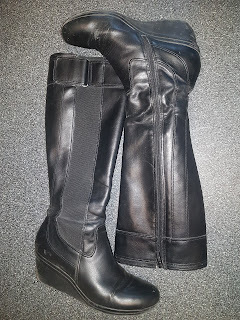 Today's highlight is my Kenneth Cole Reaction Boots. Owned for 10 years, worn less than twice a year, cracking in several places... this is it's final performance. With the noticeable cracking, it's destined for a better place that is not my wardrobe. Lesson Learnt: Clothes are meant to be worn and enjoyed! It took me so much time and effort to find the perfect pair of almost-knee-high boots that when I did, I hoarded it and wore it less than twice a year. Now the boots are cracked and no longer presentable but I got less than 20 wears out of them in my 10 years of owning. For shame!